I've had a few of you write to ask how our Justice System is supposed to work. Since I have a degree in Criminal Justice, I was going to reach back into my memory banks and attempt to recreate what I was taught some 35 years ago. But instead, I opted to do something a lot more reliable. Yes, I opted to go to what I consider a great source that explains our Justice System and how it is supposed to work. If you noticed, I said "supposed" to work. The reason that I preface how it works is because, as we all know, the system can appear broken depending on how people screw with it. My belief is that if people, judges, lawyers, law enforcement, politicians, would allow the system to work, society might find that the bad guys do get punished and the victims do get a sense of justice being served. The problem as I see it is that we don't need more laws, but instead we need law redundant laws abolished and laws enforced. Make life easier to understand for those too dense to know the difference between right and wrong, lawful and not. The problem with our system is that people have a tendency to want to input their own sense of how the Justice System "should" work and there sits the problem. The result is that criminals go free, justice is not served, and the voters seek fixes while Judges and Prosecutors may have their own biases and see punishment as something too harsh. And yes, they themselves, for whatever personal reason, may see sentences as too long. While it is not a perfect system, it does work when we can get people to allow it to do so. With that, below you will find an overview of how our Justice System is "supposed" to function from the point of a crime being first reported by a citizen and so on through the process. The information below was compiled from the U.S, Bureau of Justice Statistics. I hope you find this helpful. But before we get started, we should keep in mind that just because a person breaks the law that they are arrested. And we should keep in mind that not everyone arrested is sent to trial and then immediately found either guilty or not guilty, and then either hanged or set free. No, our notion of swift justice such as what we think took place in the Old West is not what takes place today. Keeping things simple is not a part of the system. The governmental response to crime is founded in the intergovernmental structure of the United States as set fourth in the Constitution of the United States. Under our form of government, each State and the Federal Government has its own criminal justice system. All systems must respect the rights of individuals set forth in court interpretation of the U.S. Constitution and defined in case law. State constitutions and laws define the criminal justice system within each State and delegate the authority and responsibility for criminal justice to various jurisdictions, officials, and institutions. State laws also define criminal behavior, and groups of children or acts under jurisdiction of the juvenile courts. Municipalities and counties further define their criminal justice systems through local ordinances that proscribe the local agencies responsible for criminal justice processing that were not established by the State. Congress has also established a criminal justice system at the Federal level to respond to Federal crimes such a bank robbery, kidnapping, and transporting stolen goods across State lines. Believe it or not, bank robbery only became a Federal crime when banks became insured by the Federal government in the 1930s. Unless someone is in direct violation of a Federal law, the response to everyday crime is mainly a State and local function -- local meaning County and City. While many more laws today seem to be Federal regulations and restrictions, fact is that very few actual crimes are under exclusive Federal jurisdiction. The responsibility to respond to most crime rests with State and local governments. Police protection is primarily a function of cities and towns. Corrections is primarily a function of State governments. Most justice personnel are employed at the local level. Citizens initiate the first response to crime. This first response may come from individuals, families, neighborhood associations, business, industry, agriculture, educational institutions, the news media, or any other private service to the public. It involves crime prevention as well as participation in the criminal justice process once a crime has been committed. Private crime prevention is more than providing private security or burglar alarms or participating in neighborhood watch. It also includes a commitment to stop criminal behavior by not engaging in it or condoning it when it is committed by others. Citizens take part directly in the criminal justice process by reporting crime to the police, by being a reliable participant (for example, a witness or a juror) in a criminal proceeding and by accepting the disposition of the system as just or reasonable. As voters and taxpayers, citizens also participate in criminal justice through the policy making process that affects how the criminal justice process operates, the resources available to it, and its goals and objectives. At every stage of the process from the original formulation of objectives to the decision about where to locate jails and prisons to the reintegration of inmates into society, the private sector has a role to play. Without such involvement, the criminal justice process cannot serve the citizens it is intended to protect. Many of the services needed to prevent crime and make neighborhoods safe are supplied by noncriminal justice agencies, including agencies with primary concern for public health, education, welfare, public works, and housing. Individual citizens as well as public and private sector organizations have joined with criminal justice agencies to prevent crime and make neighborhoods safe. We apprehend, try, and punish offenders by means of a loose confederation of agencies at all levels of government. Our American system of justice has evolved from the English common law into a complex series of procedures and decisions. Founded on the concept that crimes against an individual are crimes against the State, our justice system prosecutes individuals as though they victimized all of society. However, crime victims are involved throughout the process and many justice agencies have programs which focus on helping victims. Because we have 50 States, each having laws unique to their people. There is no single criminal justice system in this country. In fact, we have a framework of many similar systems that are individually unique. What that means is that criminal cases may be handled differently in different jurisdictions, but court decisions based on the due process guarantees of the U.S. Constitution require that specific steps be taken in the administration of criminal justice so that the individual will be protected from undue intervention from the State. The description of the criminal and juvenile justice systems that follows portrays the most common sequence of events in response to serious criminal behavior. The justice system does not respond to most crime because so much crime is not discovered or reported to the police. Law enforcement agencies learn about crime from the reports of victims or other citizens, from discovery by a police officer in the field, from informants, or from investigative and intelligence work. Once a law enforcement agency has established that a crime has been committed, a suspect must be identified and apprehended for the case to proceed through the system. Sometimes, a suspect is apprehended at the scene; however, identification of a suspect sometimes requires an extensive investigation. Often, no one is identified or apprehended. In some instances, a suspect is arrested and later the police determine that no crime was committed and the suspect is released. After an arrest, law enforcement agencies present information about the case and about the accused to the prosecutor, who will decide if formal charges will be filed with the court. If no charges are filed, the accused must be released. The prosecutor can also drop charges after making efforts to prosecute (nolle prosequi). A suspect charged with a crime must be taken before a judge or magistrate without unnecessary delay. At the initial appearance, the judge or magistrate informs the accused of the charges and decides whether there is probable cause to detain the accused person. If the offense is not very serious, the determination of guilt and assessment of a penalty may also occur at this stage. Often, the defense counsel is also assigned at the initial appearance. All suspects prosecuted for serious crimes have a right to be represented by an attorney. If the court determines the suspect is indigent and cannot afford such representation, the court will assign counsel at the public's expense. A pretrial-release decision may be made at the initial appearance, but may occur at other hearings or may be changed at another time during the process. Pretrial release and bail were traditionally intended to ensure appearance at trial. However, many jurisdictions permit pretrial detention of defendants accused of serious offenses and deemed to be dangerous to prevent them from committing crimes prior to trial. The court often bases its pretrial decision on information about the defendant's drug use, as well as residence, employment, and family ties. The court may decide to release the accused on his/her own recognizance or into the custody of a third party after the posting of a financial bond or on the promise of satisfying certain conditions such as taking periodic drug tests to ensure drug abstinence. In many jurisdictions, the initial appearance may be followed by a preliminary hearing. The main function of this hearing is to discover if there is probable cause to believe that the accused committed a known crime within the jurisdiction of the court. If the judge does not find probable cause, the case is dismissed; however, if the judge or magistrate finds probable cause for such a belief, or the accused waives his or her right to a preliminary hearing, the case may be bound over to a grand jury. A grand jury hears evidence against the accused presented by the prosecutor and decides if there is sufficient evidence to cause the accused to be brought to trial. If the grand jury finds sufficient evidence, it submits to the court an indictment, a written statement of the essential facts of the offense charged against the accused. Where the grand jury system is used, the grand jury may also investigate criminal activity generally and issue indictments called grand jury originals that initiate criminal cases. These investigations and indictments are often used in drug and conspiracy cases that involve complex organizations. After such an indictment, law enforcement tries to apprehend and arrest the suspects named in the indictment. Misdemeanor cases and some felony cases proceed by the issuance of an information, a formal, written accusation submitted to the court by a prosecutor. In some jurisdictions, indictments may be required in felony cases. However, the accused may choose to waive a grand jury indictment and, instead, accept service of an information for the crime. In some jurisdictions, defendants, often those without prior criminal records, may be eligible for diversion from prosecution subject to the completion of specific conditions such as drug treatment. Successful completion of the conditions may result in the dropping of charges or the expunging of the criminal record where the defendant is required to plead guilty prior to the diversion. Once an indictment or information has been filed with the trial court, the accused is scheduled for arraignment. At the arraignment, the accused is informed of the charges, advised of the rights of criminal defendants, and asked to enter a plea to the charges. Sometimes, a plea of guilty is the result of negotiations between the prosecutor and the defendant. If the accused pleads guilty or pleads "nolo contendere," latin for "no contest" which means the defendant accepts penalty without admitting guilt, then the judge may accept or reject the plea. If the plea is accepted, no trial is held and the offender is sentenced at this proceeding or at a later date. The plea may be rejected and proceed to trial if, for example, the judge believes that the accused may have been coerced. If the accused pleads not guilty or not guilty by reason of insanity, a date is set for the trial. A person accused of a serious crime is guaranteed a trial by jury. However, the accused may ask for a bench trial where the judge, rather than a jury, serves as the finder of fact. In both instances the prosecution and defense present evidence by questioning witnesses while the judge decides on issues of law. The trial results in acquittal or conviction on the original charges or on lesser included offenses. After the trial a defendant may request appellate review of the conviction or sentence. In some cases, appeals of convictions are a matter of right; all States with the death penalty provide for automatic appeal of cases involving a death sentence. Appeals may be subject to the discretion of the appellate court and may be granted only on acceptance of a defendant's petition for a writ of certiorari. Prisoners may also appeal their sentences through civil rights petitions and writs of habeas corpus where they claim unlawful detention. After a conviction, sentence is imposed. In most cases the judge decides on the sentence, but in some jurisdictions the sentence is decided by the jury, particularly for capital offenses. In arriving at an appropriate sentence, a sentencing hearing may be held at which evidence of aggravating or mitigating circumstances is considered. In assessing the circumstances surrounding a convicted person's criminal behavior, courts often rely on presentence investigations by probation agencies or other designated authorities. Courts may also consider victim impact statements before sentencing. restitution - requiring the offender to pay compensation to the victim. In some jurisdictions, offenders may be sentenced to alternatives to incarceration that are considered more severe than straight probation but less severe than a prison term. Examples of such sanctions include boot camps, intense supervision often with drug treatment and testing, house arrest and electronic monitoring, denial of Federal benefits, and community service. In many jurisdictions, the law mandates that persons convicted of certain types of offenses serve a prison term. Most jurisdictions permit the judge to set the sentence length within certain limits, but some have determinate sentencing laws that stipulate a specific sentence length that must be served and cannot be altered by a parole board. Offenders sentenced to incarceration usually serve time in a local jail or a State prison. Offenders sentenced to less than 1 year generally go to jail; those sentenced to more than 1 year go to prison. Persons admitted to the Federal system or a State prison system may be held in prisons with varying levels of custody or in a community correctional facility. A prisoner may become eligible for parole after serving a specific part of his or her sentence. Parole is the conditional release of a prisoner before the prisoner's full sentence has been served. The decision to grant parole is made by an authority such as a parole board, which has power to grant or revoke parole or to discharge a parolee altogether. The way parole decisions are made varies widely among jurisdictions. Offenders may also be required to serve out their full sentences prior to release (expiration of term). Those sentenced under determinate sentencing laws can be released only after they have served their full sentence (mandatory release) less any "goodtime" received while in prison. Inmates get goodtime credits against their sentences automatically or by earning them through participation in programs. If released by a parole board decision or by mandatory release, the releasee will be under the supervision of a parole officer in the community for the balance of his or her unexpired sentence. This supervision is governed by specific conditions of release, and the releasee may be returned to prison for violations of such conditions. Once the suspects, defendants, or offenders are released from the jurisdiction of a criminal justice agency, they may be processed through the criminal justice system again for a new crime. Long term studies show that many suspects who are arrested have prior criminal histories and those with a greater number of prior arrests were more likely to be arrested again. As the courts take prior criminal history into account at sentencing, most prison inmates have a prior criminal history and many have been incarcerated before. Nationally, about half the inmates released from prison will return to prison. The processing of juvenile offenders is not entirely dissimilar to adult criminal processing, but there are crucial differences. Many juveniles are referred to juvenile courts by law enforcement officers, but many others are referred by school officials, social services agencies, neighbors, and even parents, for behavior or conditions that are determined to require intervention by the formal system for social control. At arrest, a decision is made either to send the matter further into the justice system or to divert the case out of the system, often to alternative programs. Examples of alternative programs include drug treatment, individual or group counseling, or referral to educational and recreational programs. When juveniles are referred to the juvenile courts, the court's intake department or the prosecuting attorney determines whether sufficient grounds exist to warrant filing a petition that requests an adjudicatory hearing or a request to transfer jurisdiction to criminal court. At this point, many juveniles are released or diverted to alternative programs. All States allow juveniles to be tried as adults in criminal court under certain circumstances. In many States, the legislature statutorily excludes certain (usually serious) offenses from the jurisdiction of the juvenile court regardless of the age of the accused. In some States and at the Federal level under certain circumstances, prosecutors have the discretion to either file criminal charges against juveniles directly in criminal courts or proceed through the juvenile justice process. The juvenile court's intake department or the prosecutor may petition the juvenile court to waive jurisdiction to criminal court. The juvenile court may also order referral to criminal court for trial as adults. In some jurisdictions, juveniles processed as adults may upon conviction be sentenced to either an adult or a juvenile facility. In those cases where the juvenile court retains jurisdiction, the case may be handled formally by filing a delinquency petition or informally by diverting the juvenile to other agencies or programs in lieu of further court processing. If a petition for an adjudicatory hearing is accepted, the juvenile may be brought before a court quite unlike the court with jurisdiction over adult offenders. Despite the considerable discretion associated with juvenile court proceedings, juveniles are afforded many of the due-process safeguards associated with adult criminal trials. Several States permit the use of juries in juvenile courts; however, in light of the U.S. Supreme Court holding that juries are not essential to juvenile hearings, most States do not make provisions for juries in juvenile courts. In disposing of cases, juvenile courts usually have far more discretion than adult courts. In addition to such options as probation, commitment to a residential facility, restitution, or fines, State laws grant juvenile courts the power to order removal of children from their homes to foster homes or treatment facilities. Juvenile courts may also order participation in special programs aimed at shoplifting prevention, drug counseling, or driver education. Once a juvenile is under juvenile court disposition, the court may retain jurisdiction until the juvenile legally becomes an adult at age 21 in most States. In some jurisdictions, juvenile offenders may be classified as youthful offenders which can lead to extended sentences. Following release from an institution, juveniles are often ordered to a period of aftercare which is similar to parole supervision for adult offenders. Juvenile offenders who violate the conditions of aftercare may have their aftercare revoked, resulting in being recommitted to a facility. Juveniles who are classified as youthful offenders and violate the conditions of aftercare may be subject to adult sanctions. Very few crimes are under exclusive Federal jurisdiction. The responsibility to respond to most crime rests with State and local governments. Police protection is primarily a function of cities and towns. Corrections is primarily a function of State governments. Most justice personnel are employed at the local level. Discretion is "an authority conferred by law to act in certain conditions or situations in accordance with an official's or an official agency's own considered judgment and conscience." Discretion is exercised throughout the government. It is a part of decision making in all government systems from mental health to education, as well as criminal justice. The limits of discretion vary from jurisdiction to jurisdiction. Concerning crime and justice, legislative bodies have recognized that they cannot anticipate the range of circumstances surrounding each crime, anticipate local mores, and enact laws that clearly encompass all conduct that is criminal and all that is not. Therefore, persons charged with the day-to-day response to crime are expected to exercise their own judgment within limits set by law. which official response is appropriate. To ensure that discretion is exercised responsibly, government authority is often delegated to professionals. Professionalism requires a minimum level of training and orientation, which guide officials in making decisions. The professionalism of policing is due largely to the desire to ensure the proper exercise of police discretion. The limits of discretion vary from State to State and locality to locality. For example, some State judges have wide discretion in the type of sentence they may impose. In recent years other States have sought to limit the judges discretion in sentencing by passing mandatory sentencing laws that require prison sentences for certain offenses. 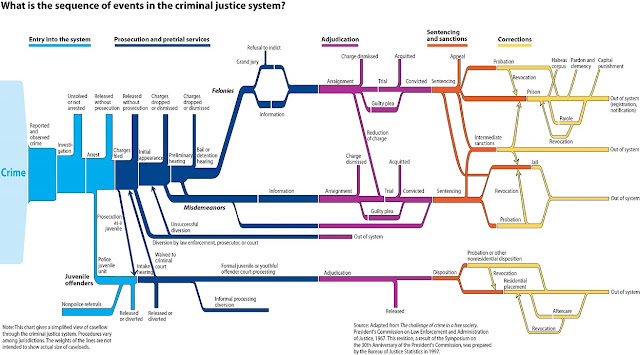 The diagram below illustrates the sequence of events in the criminal justice system. The flowchart of the events in the criminal justice system (shown in the diagram above) updates the original chart prepared by the President's Commission on Law Enforcement and the Administration of Justice in 1967. The chart summarizes the most common events in the criminal and juvenile justice systems including entry into the criminal justice system, prosecution and pretrial services, adjudication, sentencing and sanctions, and corrections. The above information was taken from the U.S, Bureau of Justice Statistics. As complicated as the system is, I really hope this has been helpful.